I think it’s fair to say that most photographers have or will try their hand at making a print of their work at some time, typically using an inkjet printer. From what I can see on the internet and from the conversations I have had around various camera clubs, many quickly give up the idea as they can’t produce a good print. Some will preserver with varying levels of success but often conclude that producing a good print is some form of dark art. 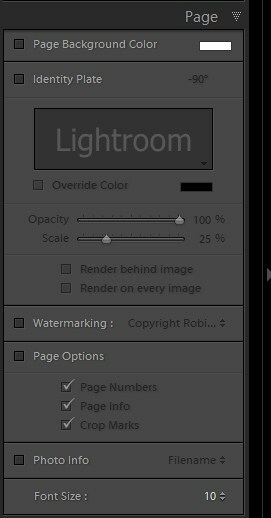 In this article I want to share how to achieve consistently good results when printing from Lightroom. To do this we will look specifically at producing a print with a single image on a page. 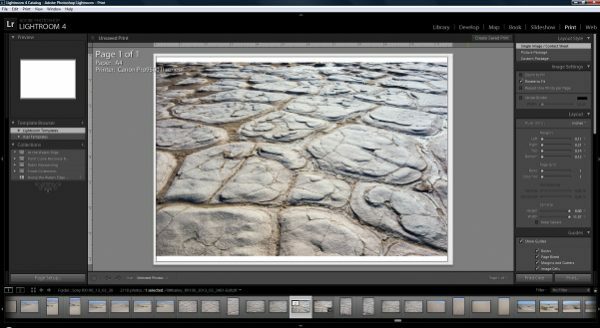 Once you master the intricacies of making great prints you can apply the same skills and explore the many other the creative options in Lightroom. You have probably heard it a million times but your monitor must be accurately calibrated and its worth pointing out that monitor calibration will drift over time. If you haven’t calibrated yours recently, do so now. It’s very easy to assume the strange colour cast affecting your prints is due to a printer problem when in fact it might be that your screen calibration is off and the printer is accurate. Periodically check your printer to ensure none of the print nozzles are blocked and that the print heads are aligned. Most print drivers have a maintenance tab to carry out common checks and adjustments such as these. To get good results you need to use good papers and inks. Don’t try to scrimp on either as you will just waste money. My experience is that the more expensive papers from the well known manufacturers will produce much better prints than the cheaper papers. When judging print quality do so in natural sunlight or if you must judge them under an electronic light, use a daylight balanced bulb. Before printing your image you should have made any necessary adjustments and applied selective sharpening. Please don’t send an unadjusted image to the printer or worse still hook up your camera. Your results will never shine. I will be using Lightroom version 4 in this article so if you are using an earlier version there will most likely be some differences. As mentioned above, before printing your image or images you need to have made any adjustments using the Develop Module so that your image is ready. As part of this process I recommend you Soft Proof the image to provide you with an idea as to how the finished print will appear. This is far more important than it might sound so if you are not familiar with how to Soft Proof an image using Lightroom look for my article covering this. Having made your adjustments to prepare your images, selected the image or images that you want to print by clicking them and switch to the Lightroom “Print” module from the menu on the top right of the screen. You will then be presented with a view similar to that shown below. The centre of the screen is dominated by the current image that has been selected for printing. On the left side of the interface is a template browser. Lightroom provides a number of preset templates that you can select from as well as create your own preset for future use. I have created a series of templates that I use frequently, each fine tuned to a specific paper and size. This is fast and helps avoid costly mistakes. Just below the template browser is the collections browser. Here you can create a named collection of images for your printing. Think of this as a virtual photo album to which you can add and remove images. This provides a quick and easy way to print a complete set of related images. Towards the bottom of the left hand side is the “Page Setup...” button. When clicked, this will open the page setup dialog so that you can adjust settings such as page size, orientation and most importantly select the printer you want to use. Along the bottom of the screen you will see a row of thumbnail images which you can click on to select. The selected image(s) will then appear in the central preview. If you hold down the Ctrl key whilst clicking on a thumbnail you can make multiple selections. When you do this you will see to the bottom left of the interface, just below the central image that the two arrow symbols become active allowing you to move between the multiple print pages. On the right side of the interface are all the controls you can use to customize your print output and which we will cover next. In the screen shot below are the first three sections of the right hand interface. There are actually 6 sections in total and if like me you find it a bit tiresome needing to keep scrolling up and down you can switch to the “Solo” mode. This causes all of the sections to collapse with the exception of the selected section. To switch to the solo mode, right click on any of the section headings e.g. “Layout Style” and select “Solo Mode” from the pop-up menu. Layout Style – use this to select one of three styles to use for your printing. “Single image / Contact Sheet” allows you to print either a single image as we are doing in this article, or produce a contact sheet of images. “Picture Package” can be used to print images in multiple sizes. “Custom Package” allows the printing of multiple images at various sizes and provides a very flexible layout editor. “Zoom to Fill” which will zoom the image so that it fills the entire cell in all directions. If the image is not the same dimensions as the cell, it may be resized in one of the dimensions and will result in part of the image being cropped. “Rotate to Fit” will rotate the image so that the largest possible image appears in the cell. This can be handy if the orientation of the cell differs from the image. “Repeat One Photo per Page” is used where there are multiple image cells on a page as with a contact sheet. Selecting this option would then ensure that the same image is used in all the cells on the page. Deselect this and you can place a different in each cell. “Stroke Boarder” adds a solid boarder around the image using a colour and line thickness that you can define. If you are not intended to mount your print behind a matt board adding a stroke boarder to an image often improves its appearance as it helps stop the viewers’ eye from wandering out of the frame. The “Margins” around the edge of the page which are the areas of the page that can’t be printed. You will only be able to set the margins to 0 if you have a printer that supports borderless printing and this feature has been activated in your print driver. The “Page Grid” options allow you to define how many image cells appear on each page and how many columns and rows they are arranged into. 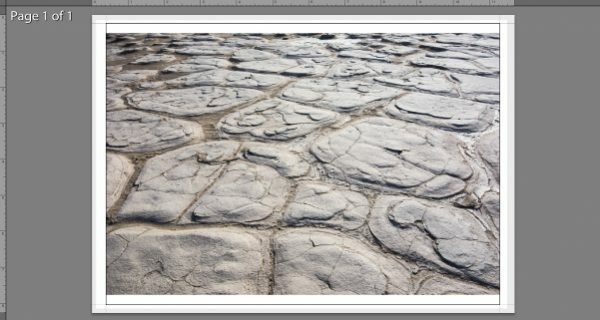 If you have defined a page layout with multiple image cells, the “Cell Spacing” options become available. Here you can define how much space appears around the cell for both the horizontal and vertical placement. “Cell Size” as its name would suggest allows you to control the size of the cells. As we have previously selected the “Layout Style” (described under point 1 above) as “Single Image/Contact Sheet” all the cells will be an identical size. To have multiple cell sizes on the same page you need to select one of the other layout options. The “Keep Square” option works with the Cell Size sliders so that when selected, the cells are always square no matter how you adjust their size. Having reviewed the various layout options, let’s examine how the print appears in the centre of the screen (see the next screen shot). Here you can see the image displayed in the centre of a white rectangle; this represents the paper you will print to. Around the image is a black box; this is the image cell. Notice how the image doesn’t fill the cell vertically, only horizontally. This is because I didn’t select the “Zoom to Fill” option in the “Image Settings” section described above. If I had, the image would have been as large as the cell both vertically and horizontally but it would have also been cropped on either side to make it fit as the cell dimensions differ from the image. Now look carefully around the very edge of the paper area and you will see a faint grey boarder and in each corner are two fine grey lines. The fine grey lines represent the margins applied to the paper when printing. You can adjust them by either clicking and dragging the line or using the Left, Right, Top and Bottom margin sliders under the “Layout section” as described previously. In the example above the grey boarder (which is the area of the paper the printer can’t print to) is the same as the margins. This need not be the case and you can set larger margins if you wish. You also don’t need to keep all the margins the same on each side and can alter these to control where on the paper your image will appear. If for example you are printing a square image on an A4 sheet you might want to place the image at the top of the page so that there is a much heavier boarder at the bottom. The next section of the interface on the right is “Guides” and is shown in the following screen shot. “Rulers” appear along the top and left hand side of the central part of the interface so that you can see the dimensions of the page. 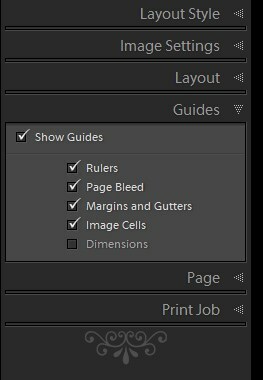 They also help you to manually place other guides such as “Margins” if you are dragging these. “Page Bleed” is the unprintable grey area around the edge of the page. “Margins and Gutters”. Margins appear around the edge of the page and control the space between the image cell and the edge of the page. A gutter is the space between two or more cells. “Image Cells” displays a black boarder around the image cell so that you can see it but this doesn’t appear in the final print. “Dimensions” displays the dimensions of the image cell next to each cell. The next section on the right hand side is “Page” and is shown in the following screen shot. Under the “Page” section you will find a whole host of options to control the information provided on the printed output such as file name and watermarking. These can be useful if you are printing proofs before making a final print. I suggest you explore these separately as we need to get onto the options that really help you to make great prints every time, which are found under the “Print Job” section as shown below. “Print to” allows you to print to either the selected printer (remember you set this up under the “Page Setup” options described earlier) or a jpg file. The option to print to a jpg can be a real time saver if you need to prepare image samples for a client, a web site or a blog. You can create your own template design including image information or perhaps a watermark and then print these to a jpg file ready for publishing or distribution by email. “Draft Mode Printing” prints in a lower resolution to improve speed and use less ink. It is not however suitable for producing a quality image print and I suggest you don’t use it unless you have a specific purpose in mind. “Print Resolution” controls the quality of the printed file. A print of 240ppi will appear photographic quality but you will probably be able to see it is of lesser quality when compared with a print of the same image at 300ppi. 300ppi is the generally recognised standard for producing top quality photographic output although some printers have a native resolution that differs from this and usually improves performance slightly (but we won’t cover that here). Other factors such as image type and paper also play a part in determining the optimum ppi setting, but 300ppi is an excellent default to use. “Print Sharpening” controls the level of sharpening to be applied to your print as it is sent to the printer and is an important variable in obtaining consistently high print quality. The approach you should use is to sharpen your image to the desired level prior to printing. The sharpening in this section is designed to compensate for the softening effect caused by actually printing the image. Ensure you select the correct “Media Type” for your paper which is either Glossy or Matte as this affects how the sharpening is applied. 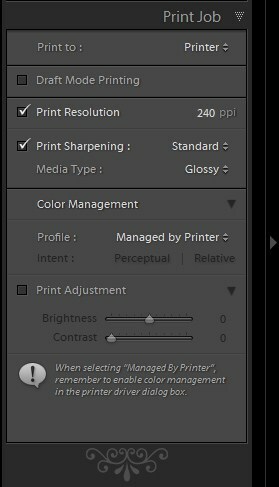 You should then select the level of “Print Sharpening” which can be “Low”, “Standard” or “High”. Make this decision based on the detail in the image for example the image shown in my screen shots above contains lots of fine detail so might benefit from a high level of sharpening. Had the image been of clouds, I would have set the sharpening to “Low”. If you are in doubt, set the level to “Standard”. Unfortunately you don’t get any preview as the sharpening is applied on output. For this reason you might decide to sharpen your image for output visually in the develop module and turn off the output sharpening. If you do decide to do this, try setting your view to “1:2” (50% magnification) as this gives a closer approximation to the printed output than viewing the image at “1:1”. My personal preference is to use the print sharpening in the Printing module. “Color Management” is possibly the most important setting in the “Print Module” if you are going to produce a physical print on a printer. The options here are “Managed by Printer” or one of the printer profiles installed to your computer. As you can see from the screen shot below I have a number of profiles configured to display for easy selection. Clicking on the “Other...” option at the bottom of the list would display all my machines profiles. This is where you can configure the list (if you are not familiar with printer profiles they are explained shortly). In this section it is important that you select a printer profile for your particular printer and paper combination; do not select the “Managed by Printer” option as it is likely to result in sub-standard output. Once you have selected a printer profile you will see that the “Rendering” option becomes available. I won’t go into why here but the best option for general printing is likely to be “Perceptual”. The “Print Adjustment” option allows you to amend the “Brightness” and “Contrast” of your output. People have often complained that their prints don’t match what is displayed on the screen even when using the correct printer profile. These sliders allow you to compensate for this variation. I have actually found different levels of adjustment will produce small improvements and different papers need different levels of adjustment. Don’t worry however if you don’t want to use these as in my experience they only give a marginal improvement that many people won’t notice. Printer Profiles have been mentioned a number of times above as they are a vitally important part of printing. They are instruction files that determine how an image should be reproduced by your printer. They control variables such as how dark or light the image should be by controlling how the ink is applied to the paper. This means you will need a separate profile for each printer and paper combination. The theory is that the printed image will match what is seen on screen (when soft profiling) and generally this works well. Use printer profile created by the printer or paper manufacturer for your printer and paper combination. Most paper manufacturers now provide downloadable profiles on their website. Use a custom profile created for your specific printer and paper combination. This is more accurate than the generic printer profiles however its time consuming and expensive. This is the option that I use but you need special equipment and software to create them. The print differences when compared to the manufacturer profiles are only slight so don’t worry about needing to invest. Some paper manufacturers also provide a custom profiling service for free. I have used these in the past and they are excellent. Once you have installed your profile (how you do this depends on your computers operating system and instructions can be found on the internet), it should be selected when printing to the paper it was intended for. There are noticeable contrast, colour and saturation shifts between profiles if you select the wrong one. Is the paper size correct? Have you selected the correct type of media in the print driver to match the paper you are printing to? 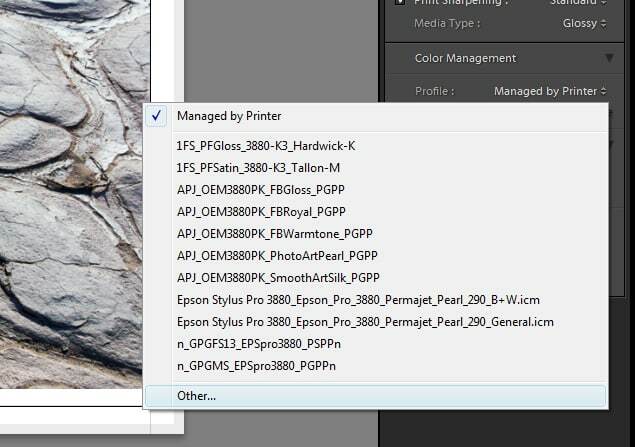 Have you set the print driver colour management to be managed by the host application? If you don’t set this the printer will try to adjust the image further so that your colours will be wrong. As I write this I have just managed to send a colour image to my printer and the printer was set to produce a black and white image – I need to take my own advice. If your printer can be set up to print in black and white in its driver have you checked its set to match the image you are producing? Have you set the printer resolution and quality to a level suitable for the image you are producing? It’s no good having the printer set to high speed draft when trying to produce a fine art print of a detailed landscape. Once you are happy press the print button and wait for your masterpiece to be produced. Superb! The transformation of a shot to a print is complex, but this guide has helped me to understand and address the basic print. For me, still much to do and understand including the relationship between Lightroom and my printer. Thanks for the positive feedback. I’m pleased this helped you.